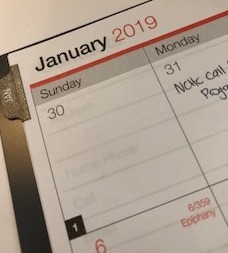 I know it’s September, but if you’re like me, 2019 began months ago with a scheduled dental appointment, club meetings and conference dates. By early August, my notes for the coming year were bunching up on the margins for December. It was time for me to buy a new calendar, one of those broad spiral notebooks with a vinyl cover and two pages of squares for each month. For me, the year starts in January, as I was taught in first grade. Now, I learn, you can buy 12-month calendars that start at different times. Last month I found calendars for sale covering the months of July through June—catering to business people and teachers, I suspect. To my dismay, none began in September or October though a few were still available that started April 1, no April Fool. Who starts their year in April? When it comes to keeping time, I’m a purist. The proper year is January through December. It would be nice to have a few bonus months thrown in—maybe November and December 2018, or January 2020 to help us bridge to a new year of thinking. I am fixated on a two-page spread of numbered squares to fill in because, frankly, if I don’t have space to write it down, it won’t get done. The squares need to be large enough—say, two inches by two inches. I told a friend about my calendar dilemma. She understands my thinking because she also refuses to let her Smartphone replace paper. I told her that I had no idea that so many paper formats exist. Calendars are printed on a rolling basis, she said. Fiscal years—July to June—have shaken up the calendar world. She advised me to check an office supply store. So I did, but not without grief. The 2019 format I wanted came only with a gray cover, which makes me wonder what harbinger this color may mean. 2018 was a nice cheery red. Of course we haven’t always lived a January-December existence. Until 1751, the old-style Gregorian calendar used in the English-speaking world, started each new year on March 25, roughly synchronized with the spring equinox, the time for spring buds and new beginnings. March 25 was also Lady Day, the festival of the Annunciation to the Virgin Mary. The Julian calendar, adopted by Britain and its colonies in 1752, began the year on Jan. 1. That calendar was originated by Julius Caesar to honor Janus, the god of doors. Thus January was the “door” to the year. The American election cycle used to be synchronized with the old style calendar in a sense. Prior to 1933, we swore in our presidents in March, not January. Still, I think it’s wrong for a year to begin in April or July or any month other than January. I’m a creature of habit, and my habits began in the 20th century, but now that I have my 2019 calendar, I’m good to go.